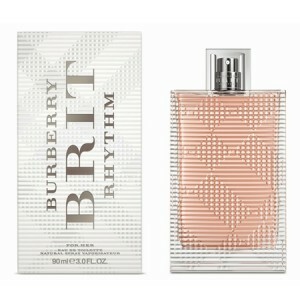 Burberry Brit Rhythm for Her with adrenaline and female energy. Burberry Brit Rhythm for Her 90ml. Eau De Toilette - fragrance that reveals the essence of the modern woman in its constant motion. Passion for change and stability usual undercurrent of desire, which we all started to forget. Do it as thoroughly and accurately as he, could not yet any perfume. What is the secret of this version? Burberry Brit Rhythm for Women gives a woman the opportunity to feel passionate surrounded by musk and pepper, and then sends it to soak in a little flower kingdom, and then returns to the woody notes. Burberry Brit Rhythm for Women can be your friend. After all, he's the one already knows how you'll be spending tomorrow night - on a date, or with friends in the club. Release Date : 2014 Producer : France Made in: France Gender : Female Classification flavor : woody, musky, floral Top notes: English lavender, pink pepper, neroli note "Hearts" : orris root, blackberry leaves, orange blossom Base notes : vetiver, musk, woody notes Perfumers : Nathalie Cetto, Antoine Maisondieu. is designed to reduce the men crazy. Top notes of the fragrance attract undeniable attention and surprise its exquisite originality. English lavender, neroli, and notes of pink pepper open bold composition series of perfume. Heart chords "Brit Rhythm" fragrant richness of orris and orange blossom tenderness. Mild extravagance and passion give flavor notes of black currant. Basic chords toilet water are vetiver and musk - note femininity and languid sensuality. Price for the novelty of the season in our store is set quite democratic, so you can easily buy this perfume and enjoy the boundless energy of the British.